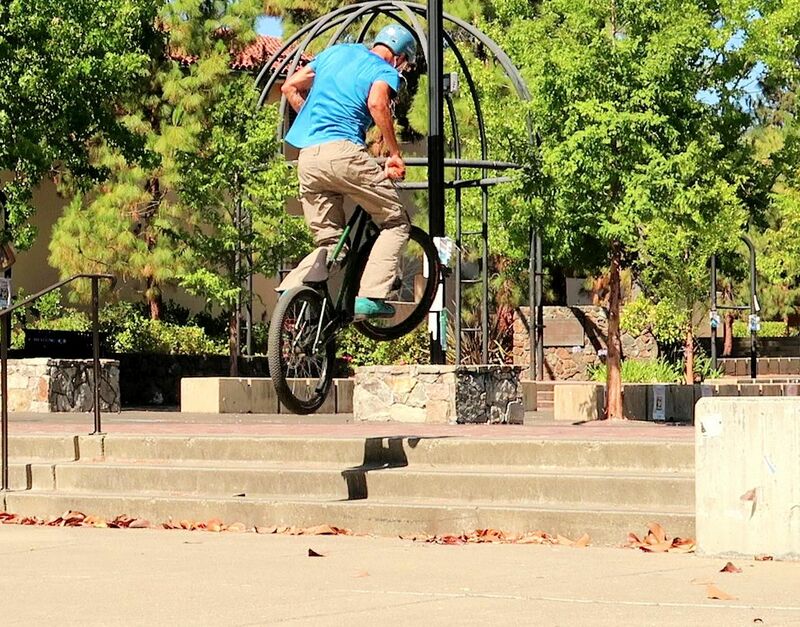 There are loads of interesting variations of the bunny hop, the 180° or 360° bunny hops combine nicely with other tricks, either to exit a line, jumping down some stairs, or simply to enjoy more spin between two flowing moves. Carve, jump, spin and tuck 'till you land. It usually feels more natural to turn to your back foot side (in the direction opposite your front foot) but try it for yourself and see what works best for you. Try first on a clean flat surface, not going faster than at a jogging pace so you won't crash too hard if you land sideways. 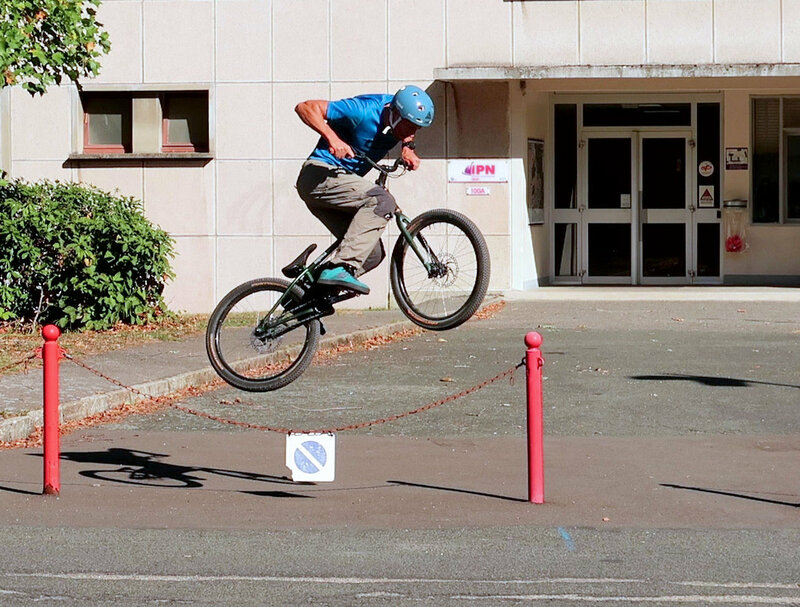 180° bunny hops won't pose much of a problem as long as you don't touch the rear brake. To build up your spinning momentum, you'll have to carve a quick sharp turn just before take-off, turning to your back foot side as you crouch on the bike to compress up both tyres. You'll need to approach the obstacle at about 45° so that you can initiate your jump extension facing the obstacle, spiralling upward into a 180° bunny hop. 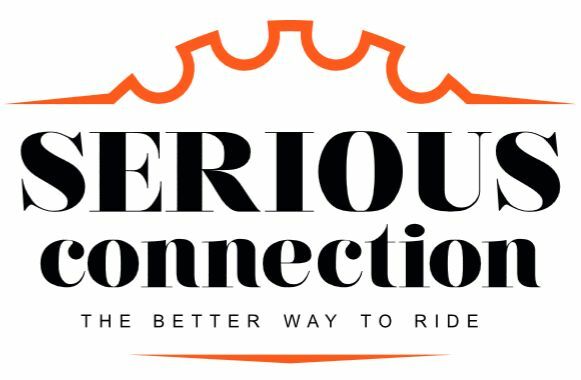 As you move up on the pedals in extension, boost your spinning momentum by turning the bars further (as if you were still carving into the curve). Emphasize the rotation with your torso during the whole jump impulse to create additional rotational momentum. As the rear wheel takes-off, carry-on with the rotation by pulling further on the handlebars to re-align the bike with your torso, but also apply back-force on the pedals to scoop the rear wheel up, lifting the bike over whatever gap or obstacle you are jumping over. Throughout the whole turn, actively keep the obstacle in check until you've cleared it with both wheels. Before you land, stretch arms and legs again to let the bike drop and get extra damping flexibility to absorb the impact. 1° Approach the obstacle at about 45° then carve a sharp turn, turning to your back foot side as you crouch on the bike to compress up both tyres. 2° Then initiate your jump extension, leaning your shoulders to your back foot side as you move up on the pedals to keep carving the turn with your torso. 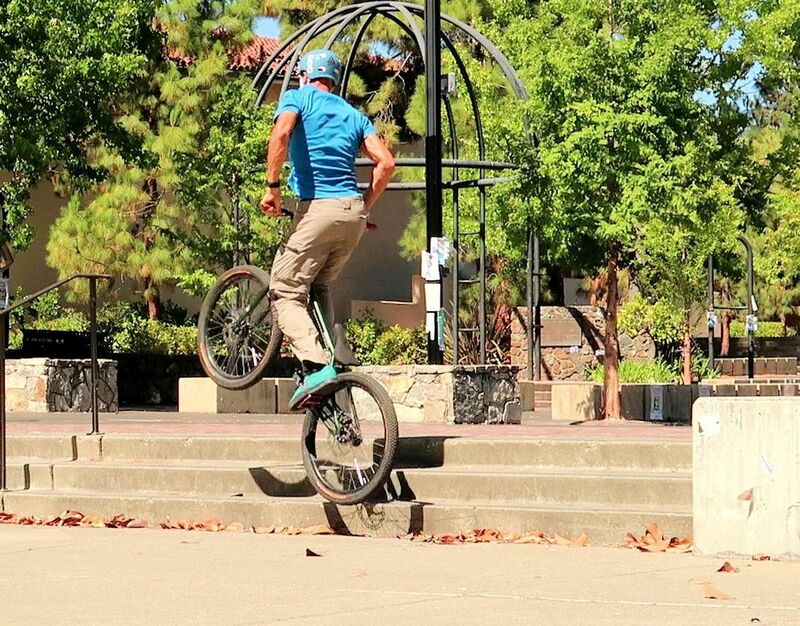 3° As you take-off, keep the handlebars turned into the rotation to maintain your whole spinning momentum. 4° Using pedal back-force, scoop up your rear wheel to level up the bike. Throughout the whole turn, actively keep the obstacle in check. 5° Once you've cleared the back wheel, stretch arms and legs again to let the bike drop and get extra damping flexibility as you land backwards. 6° Stay supple enough to absorb the impact while back-pedalling, then give a sharp turn opposite your initial carve to slide the front wheel in the general move direction. Landing fakie, about to launch a half cab. 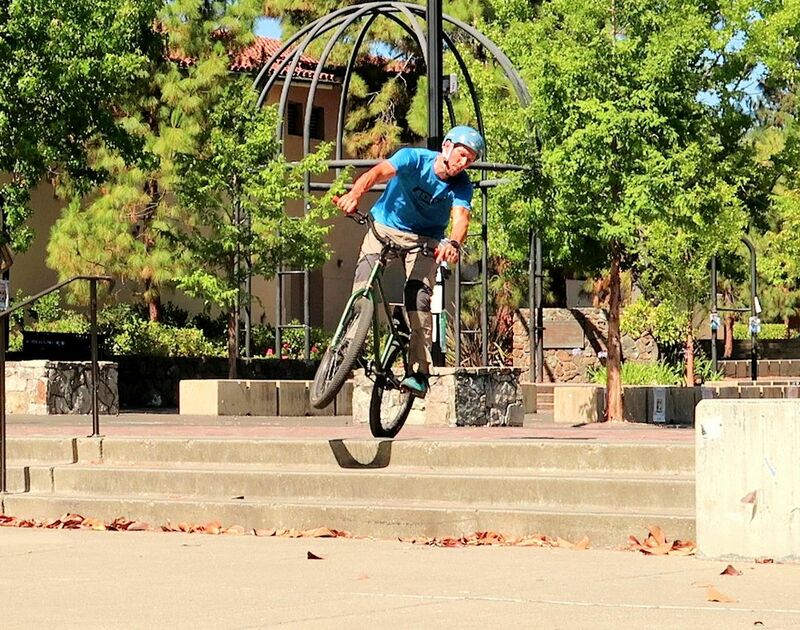 As you land backwards (fakie), don't use the brakes but back-pedal instead to stop progressively. Doing this at speed is difficult, as any deviation from a straight line will send you off-balance, and you must also be supple enough to flex and absorb the impact progressively. 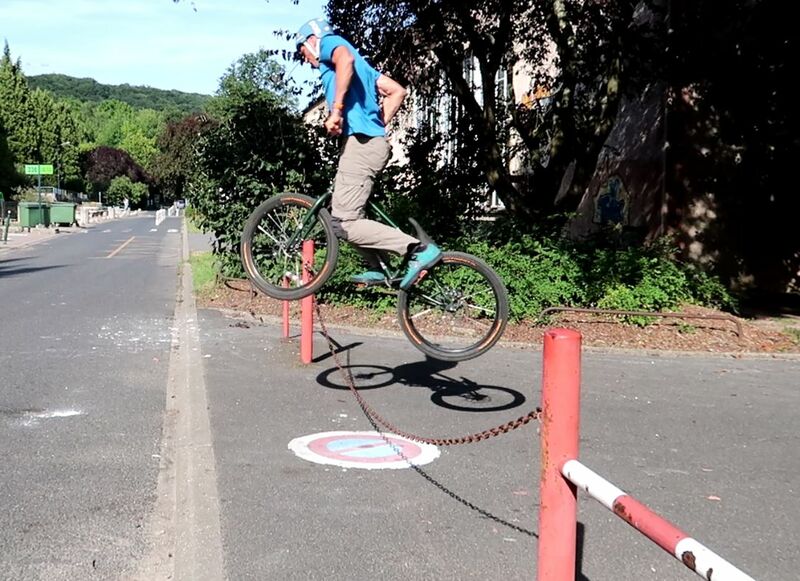 So shortly after you've landed (a couple of pedal strokes going fakie), give a sharp swing in the bars (figure out your preferred side) to finish off the turn with an extra 180° of spin around the rear wheel. Make sure you stay well centred over the back wheel to relieve pressure from the front wheel, it will be easier to roll the latter to the side. 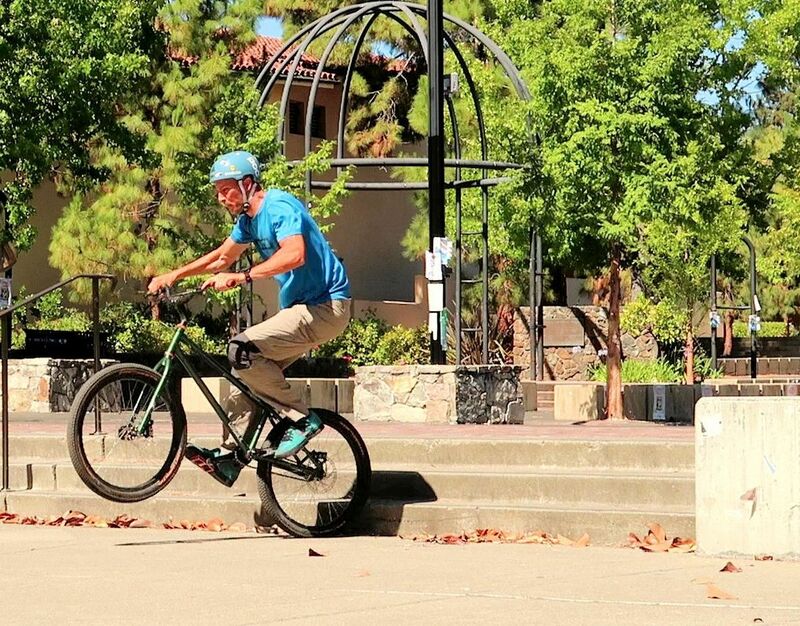 You can complement the move with a quick pedal kick to hop and boost the 180° spin, landing directly forward (half cab). 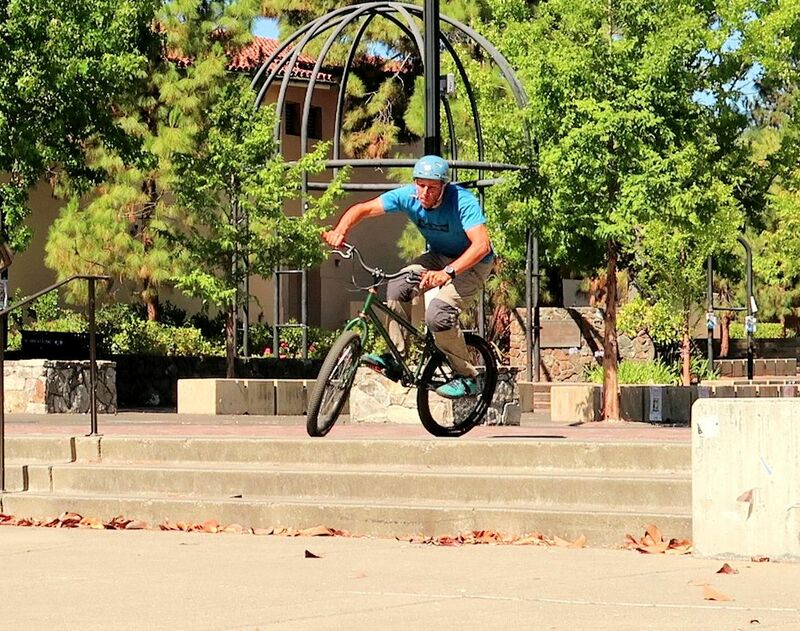 The half cab is a convenient way to spin 180° from riding fakie to riding forward, it combines the attributes of a bunny hop with a 180° pedal kick. 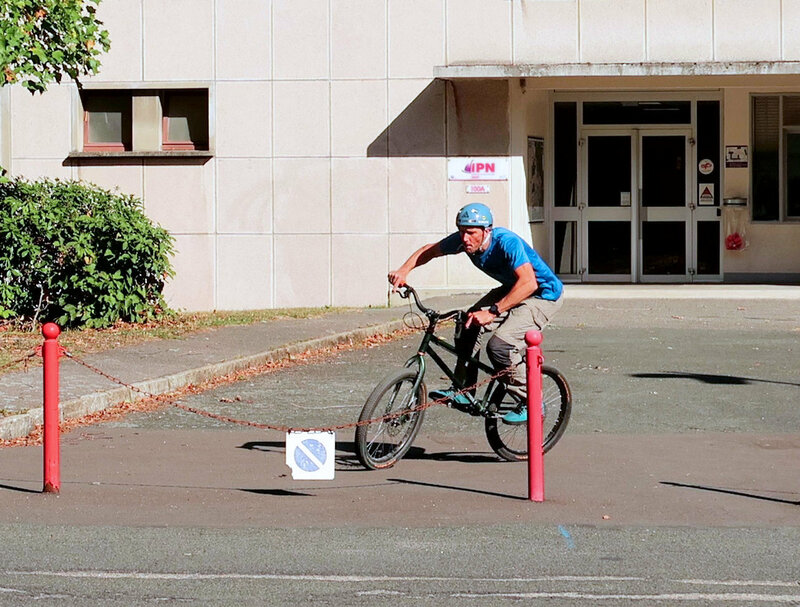 For easy practice, you can go up a ramp and let the bike roll back, or hop onto a kerb and back hop off it to build enough speed going fakie. 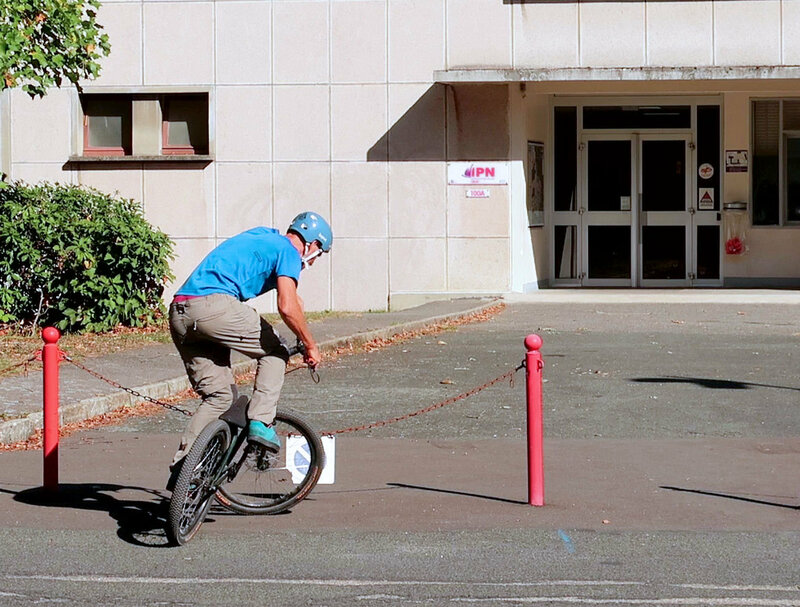 Note that for the half cab, you should also lean quite low on the bike as you backpedal, your chest close to the stem and your bum over the rear hub. This will ensure that when you turn the handlebars (opposite the direction you want to spin), you won't get thrown of the bike but stay in control as it spins around its rear wheel. This will also give you enough pump leverage with the arms to throw yourself into the move. As you backpedal, start turning the handlebars when your front foot is about to reach its low position forward (it could also be your back foot when it reaches the front position). At about 45° of the rotation and when your pedals are about level, swing the handlebars to the other side (forward facing) while giving a strong pedal kick. Surge to follow the front wheel (mostly with your head and shoulders) to jump on top of the pedal kick. 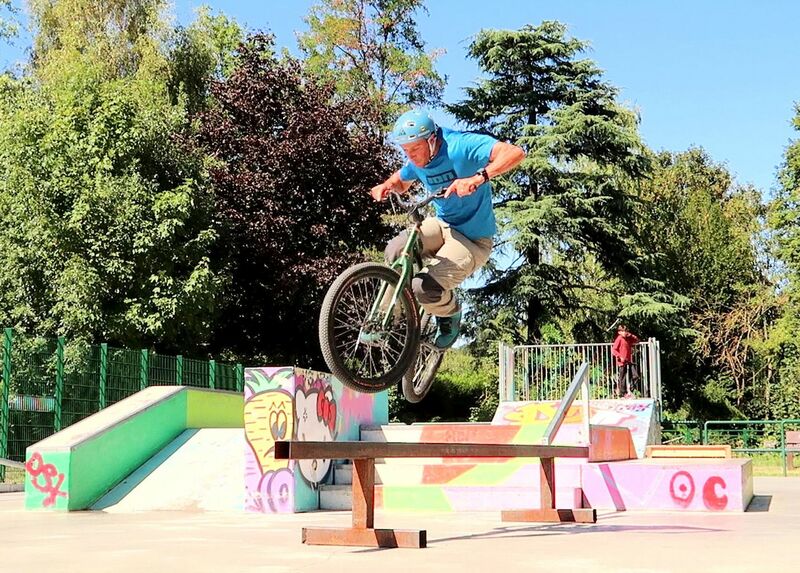 Note that with practise, you'll find it easier to kick the half cab with your back foot as it reaches the forward position sooner when landing a 180° bunny hop. The half cab is all about timing. Regardless of the direction you chose (or not) to spin, adjust your kick to time it with a swing of the handlebars, just when your front pedal is back up. In some cases you'll want to backpedal faster to reach the correct pedal position as you unwillingly turn backwards, or you may even want to kick with your lazy foot if the context makes it more practical (typically landing a 180° bunny hop). Depending on how much power you kick in, you'll either hop the full bike or smoothly pivot on the rear wheel to carry on with a manual. Hold on the tuck for longer. 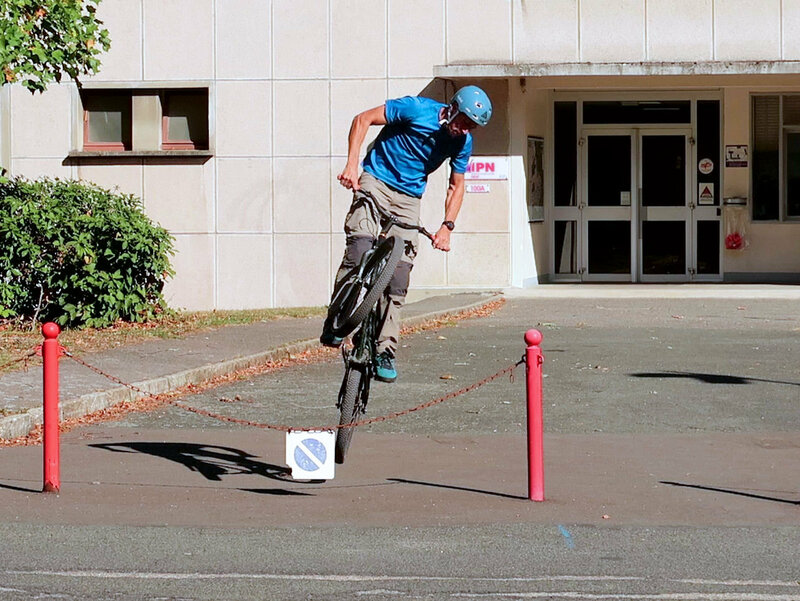 The 360° bunny hop requires exactly the same technique as for the 180° bunny hop, only more energetic when carving the turn and pushed further with more air time to complete the full rotation. 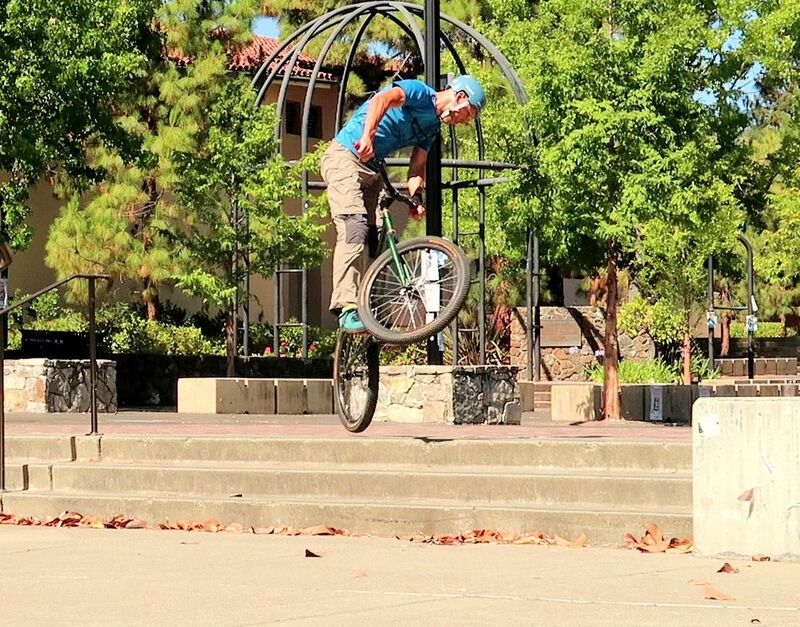 That means either launching a bigger bunny hop, tucking for longer to have more time to complete the rotation before you land, or launching your bunny hop from a high point, to complete the turn as you drop. But carving a sharp turn as you preload your bunny hop is key. 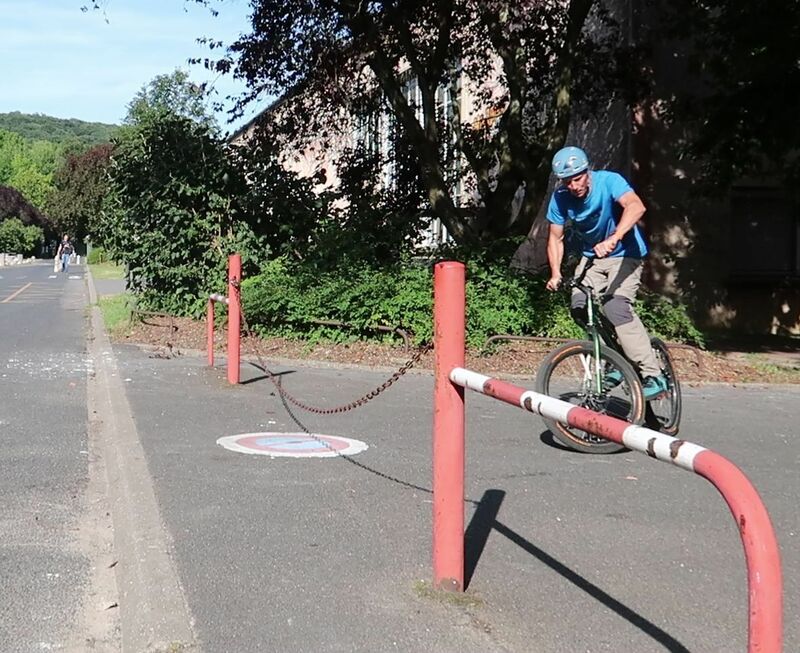 The 360° bunny hop will be a bit harder to clear on a flat but you should be able to rectify your landing by spinning whatever remains of the full turn on the rear wheel. Let the rear wheel roll (don't grab the rear brake), it will ease your spin. Keep your rear tyre pumped up so it won't stick and twist upon landing, but spin frictionless instead. Practise on flat first and find your marks so you can launch your bunny hop precisely at a given point. 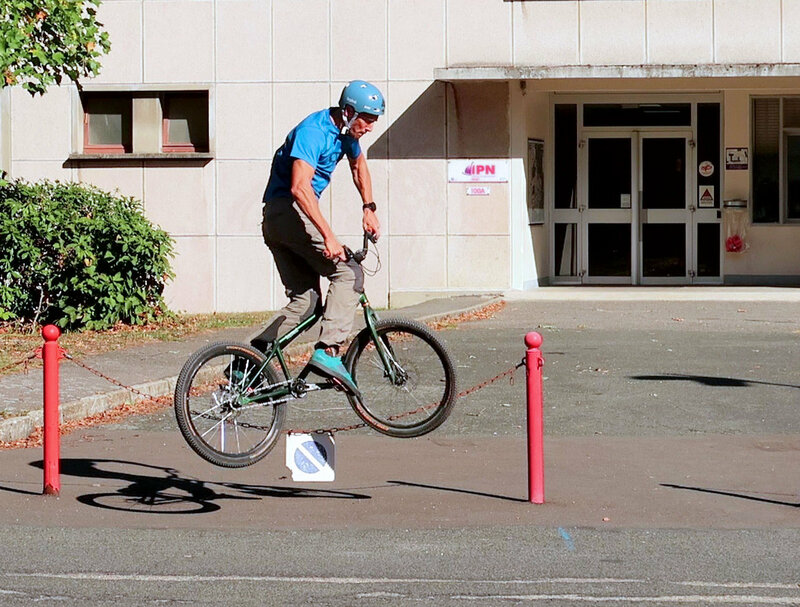 Then tune your 360° bunny hop skills down small kerbs or off a couple of steps. 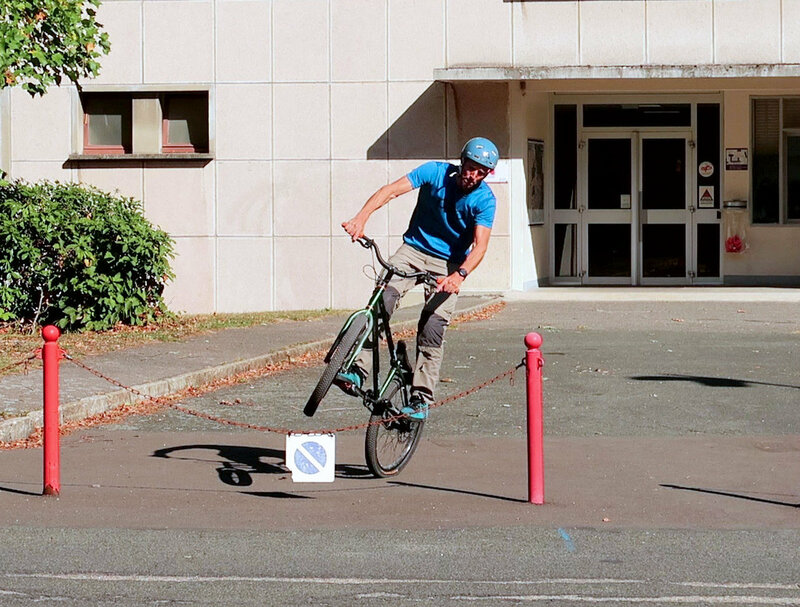 A good bearing is to initiate the spin with your front wheel taking-off from the kerb at a 45° angle. 1° On a straight run up carve a quick S pattern, crouching as you carve a sharp turn 45° to your back foot side to compress up both tyres. 4° Flex up your knees and lift up the bike with your arms to maximize air-time, the bike will spin faster in a standing position. 5° Maintain the tucked position until you have cleared the gap, then let the rear wheel drop first to prepare for touch-down. 6° Upon touch-down, let the rear wheel roll (don't grab the rear brake), it will ease your spin to complete the turn if necessary. If you don't have enough room to approach the kerb or the drop at a 45° angle to carve a turn before you hop (because the run up goes straight), then one easy fix is to carve a quick S pattern as you crouch. Even on fairly narrow lines, you can easily accommodate a short 20° turn to your front foot side before immediately carving 45° to your back foot side. This will give your shoulders enough rotational momentum to spin the whole bike as you jump. Once in the air, maintain the tucked position until you have identified your landing spot, and adjust for touch-down accordingly. Down bigger drops, force yourself to land both wheels level to secure your reception.